The first time I tasted cumin in Chinese cooking was in Beijing with Ling. It was the year before the Summer Olympics and we were hard at work, travelling from one meal to the next, arduously food reporting for More magazine, analyzing and recording every delectable mouthful that came our way. The Cumin Find was at lunch. It was a rustic Xi’an-style place, with small wooden tables, rickety seats and glass panes smudged with layers of steam and dirt. We had spent a hungry, stomach-growling hour crisscrossing alleys and laneways searching for this hideaway. Ling kept our search ignited with enticing tales of hand-pulled, perfectly chewy noodles swimming in vast bowls of rich, heavily spiced lamb broth. A smiling, pudgy cook-owner wearing a white pillbox cap and apron plonked two steaming bowls down before us while yelling something over his shoulder in Shaanxi dialect. Ling and I shared knowing smiles. This place was the real deal. We dug in, chopsticks on the right, ceramic soup spoon on the left to catch any remnants that fell from our eager lips. Steam clouded Ling’s glasses and I could have sworn I heard her purr after each mouthful. She tried to ignore me, but my questioning was incessant. “What you talking about?” she blurted out between gulps. I let her pause and collect her thoughts. She was used to me asking a lot of questions on this trip, especially mid-bite. I waited. Ling continued to revel in the meal… she’d moved on to her roujiamo or Chinese hamburger. She gripped the clay-oven flatbread bun with both hands, inhaling its charcoal overtones. Stuffed with fat, soft morsels of grilled lamb, this Xi’an wheat flatbread bun is famous for soaking up loads of gravy without falling apart. I watched a dribble of lamb juice trickle down Ling’s chin and detected that purr, again. “What is it?” I asked again. Despite the prospects of a cold lunch. Despite the look of irritation on Ling’s almost-always angelic face, I pressed on, asking her to write down the two characters that were pronounced zi and ran. Patiently, Ling wrote down the zi character on the palm of her left hand with her right index finger, making sure I was watching every stroke as she forged the invisible ink used by Chinese when pantomiming how to write a Chinese character. She wrote ran stroke by stroke even slower this time, sensing all the ignorance painted in my blank stare. She stopped her invisible writing and we both groaned. I hadn’t recognized any of the gibberish she had scrawled. I knew how to write naturally in Chinese but this ziren– this ziren she’d just written on her palm – spelled out a spice that was unnaturally Chinese: cumin. The Xi’an chef had tossed crushed, whole cumin seeds into a firey wok glistening with oil and loaded with garlic and dried, hot red peppers, elevating our simple bowl of hand-pulled noodles into a culinary epiphany for me. Cumin had seeped into the juicy lamb chunks, too, washing away any untoward mutton-ness and caressing it with a nutty, deeply Middle-Eastern allure. I was hooked – even if the Chinese pronounced cumin like its homonym naturally. Ling’s face was flushed. We had shared a tall bottle of Beijing beer to soothe the zing of all the hot dried red peppers flecked throughout the soup. I looked around. It seemed as if everyone in Beijing had apple-red cheeks during this cold, autumn spell. Just the day before, Ling and I had run outside the Temple of Heaven, trying to escape gusting winds that lashed against our skin like ice daggers. Our week in Beijing was to end tomorrow and Ling put down her chopsticks, wiped her chili-oil smudged lips and made a promise for Toronto. Eleven years later, I sit in her refitted and renovated kitchen and watch Ling cook in her wheelchair. She zips from one end to the next, pulling small packages of meat from the freezer, scooping Jasmine rice from a lower bin and standing on her one leg to reach for items above the counter. I have brought her a big bag of raw cumin seeds and she rolls her wheelchair before the stovetop range and turns the front burner on high. In minutes, the beige-green seeds in the dry, hot wok turn chocolate brown and the room fills with a smoky, nutty aroma. Deftly, Ling tips the contents of the hot wok on to a plate. With a wooden spoon, I guide the seeds into a coffee grinder. 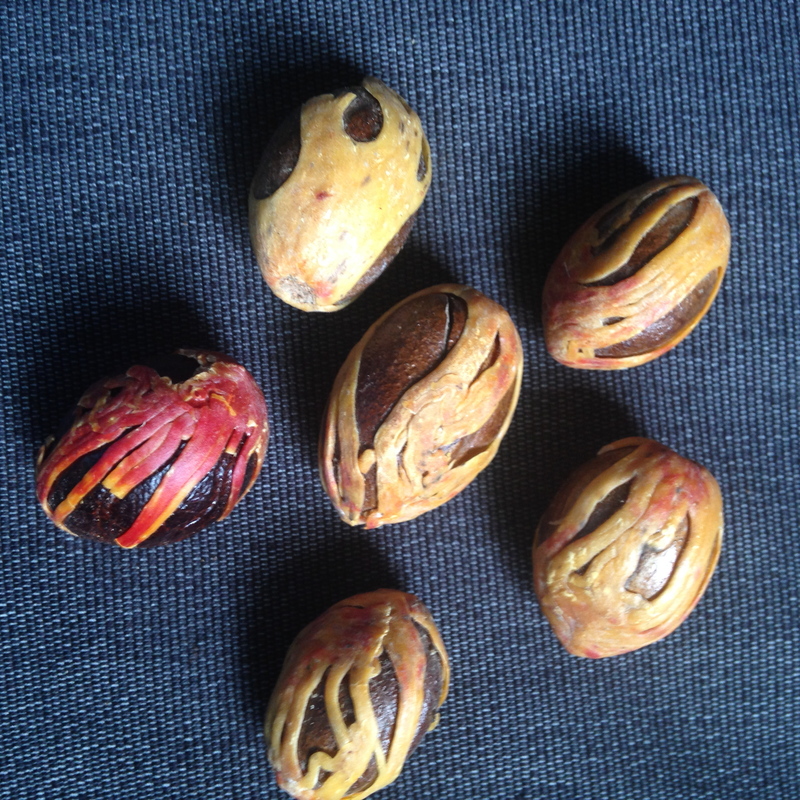 Some seeds scatter and we say “Ai Ya!” in unison. I hold the top of the grinder down firmly as the machine whirls the seeds into powder. When I lift it off, twirls and wisps of cuminy, smoky clouds twist in the air. Ling and I both poke our noses in the cloud and swoon. Naturally. Last spring, I enjoyed many cooking sessions with Ling and her fine cook, Lina who hails from Hunan Province where they eat as many – if not more – hot chillies than they do in Sichuan. Whenever Ling purchases flank steak, she slices it up into small packages for the freezer. During the prep for a dish, Ling lets the meat defrost slightly until it’s easy to slice up sliver-thin, toss into a bowl and marinate for at least 10 min. Slice defrosted flank steak as thinly as possible. Put in a bowl and marinate with corn starch, wine, tamari and cumin (while you chop the veggies or put on some steamed rice). Heat wok on high, add oil and stir-fry shallot and bell peppers with a pinch of salt until tender (about 3 min). Transfer to a plate and reserve. Without cleaning the wok, add another tablespoon oil, put beef into the wok and pat it down flat to the surface to sear for 1 minute without stirring. Once it is white around the edges, stir it until no longer red. Add stir-fried onions and bell peppers, fresh chili paste, chili oil and wine. Splash in some water if you want it saucier. Garnish with finely chopped green onions. Thinly slice 20 fresh hot red peppers. Place about a third in a small glass bowl or mason jar, sprinkle heavily with salt, layer with another third, salt, and add the final layer, the salt. Add a few drops vodka. Mix with chopsticks and refrigerate. Beware, this is HOT. Decades ago, I warned Toronto Star readers in my “Taste of Asia” column to throw out any ground spices and herbs in their cupboards older than six months. I said they were past their prime. Defunct. Bad stuff. No one likes a bossy food writer, so I tried to soften the tone and replace visions of global spice carnage with a gentle challenge: Close your eyes, open a random bottle and take a whiff. “If you can’t smell anything, toss it,” I cajoled. Well, I’m still on a spice rant after all these years. Commercially dried and ground spices and herbs lose most of their je ne sais quoi the moment they are harvested and processed, for it is at this juncture that their flavour-filled essential oils begin to degrade. When herbs and spices are ground into a powder, they are exposed to the ravages of oxidization and time… especially if they fall into obscurity in a deranged spice drawer like mine. Luckily, mine underwent a radical makeover last week. I threw out all the wizened and yellowed dried red peppers, aroma-less ground powders of dubious distinction and the contents of any package, bottle or tin box that landed in said drawer prior to 2015 – with the exception of nutmeg. I’m the proud owner of some relatively ancient nutmeg nuts, encased in shells and decorated with a fancy filament of mace. They come from Grenada and I began to horde them after several culinary visits to the Spice Island of the Caribbean. Alas, these nutmegs have broken all my self-imposed “Spice and Herb Guidelines”. They demonstrate incredible flavour once I hack off the shell with the blunt end of a knife and finely grate with my Cuisipro rasp. The places this nutmeg goes! Sometimes it’s just a sprinkle over a Grenada-style rum punch. Or, a teaspoon into garam masala bound for a Punjabi-style curry. So alive are my nutmeg relics that a taster at my table recently detected a single smidgen slipped into a creamy, rich Yukon gold potato gratin. 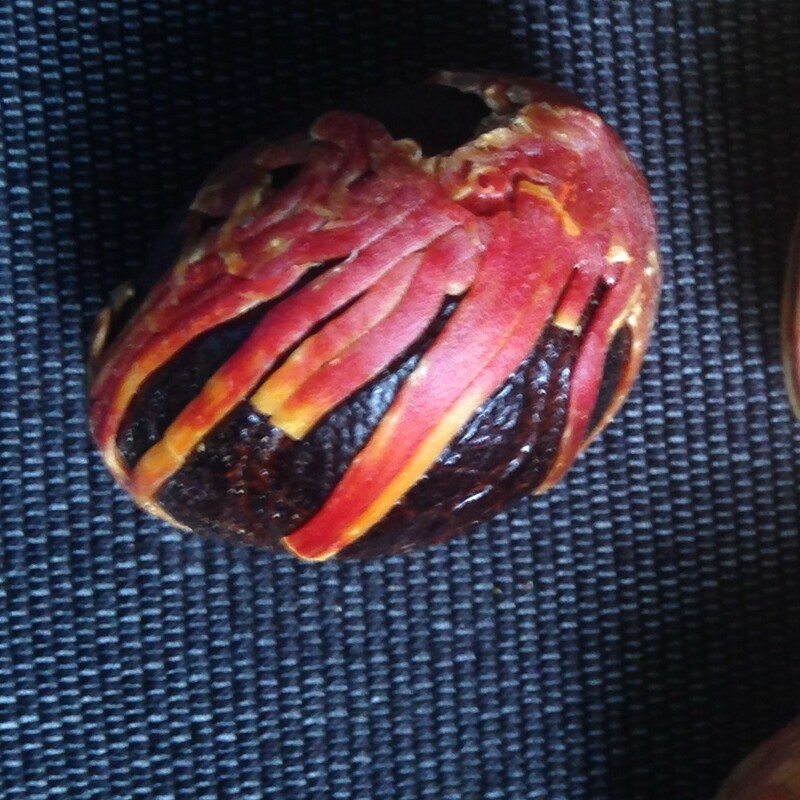 Despite an undeniably close connection to the ever-popular nutmeg, mace is one loner of a spice. It boasts a well-known affinity with pumpkin, but just doesn’t seem to pop up on the recipe radar otherwise. 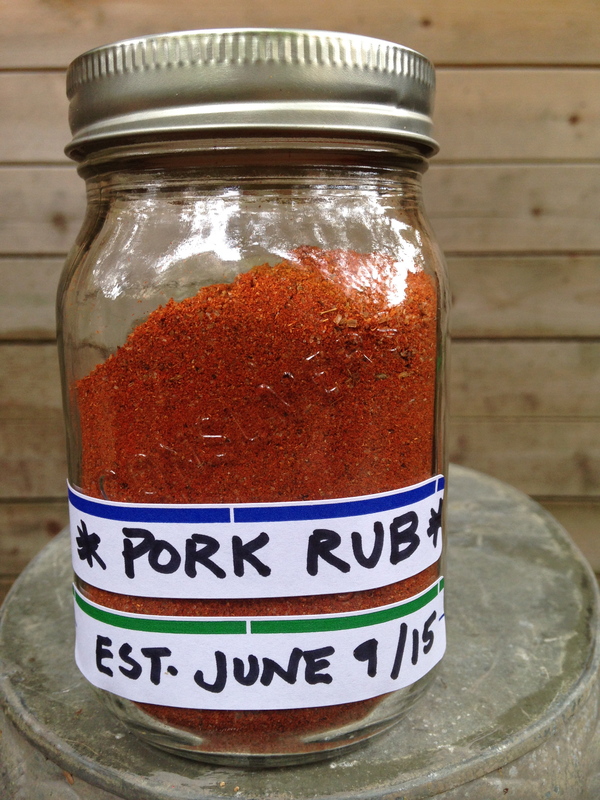 You can imagine my glee, when I stumbled on a rub recipe calling for a whopping teaspoon of the stuff. 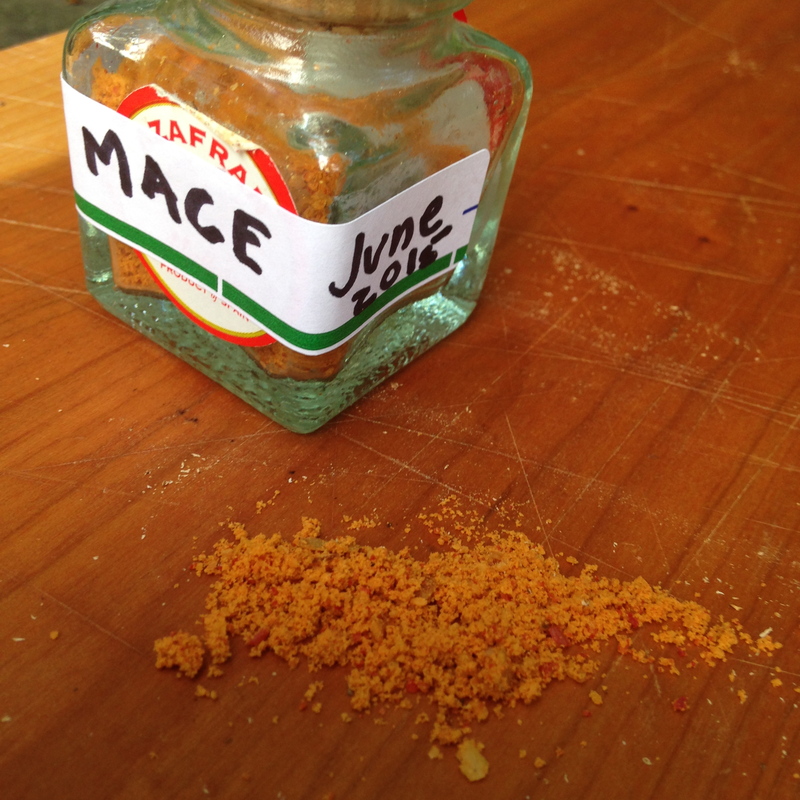 I had some whole mace at my fingertips and was ready to put it through the grinder. I simply peeled the lacy filaments off my whole nutmegs and placed them in my trusty spice blender that has continued to get revved up over all the cumin, cinnamon, cloves, cardamom (green and black), peppercorns, hot peppers, coriander, all spice, fennel and fenugreek I have been feeding it for the past three decades. In went the mace filaments and out came a surprisingly pumpkin-toned powder that tasted more pungent and citrusy than its soul-sister nutmeg. When I closed my eyes and did a side-by-side sniff of the two, it was difficult to tell them apart. No wonder McCormick spice’s web site suggests putting either one in many of the same destinations, be it custards, eggnog, spice-filled quick breads or dusted on steamed veggies like carrots or sugar snap peas. Back to the rub, which I spotted in my beloved Joy of Cooking but as per usual, put my own riff on. I chose it not only for the mace, but all the roasted cumin and cracked peppercorns. Admittedly, cumin is my favourite. Sometimes I grind it raw, but I’m more apt to first toast the seeds in a dry frying pan over medium heat until they start to smoke. 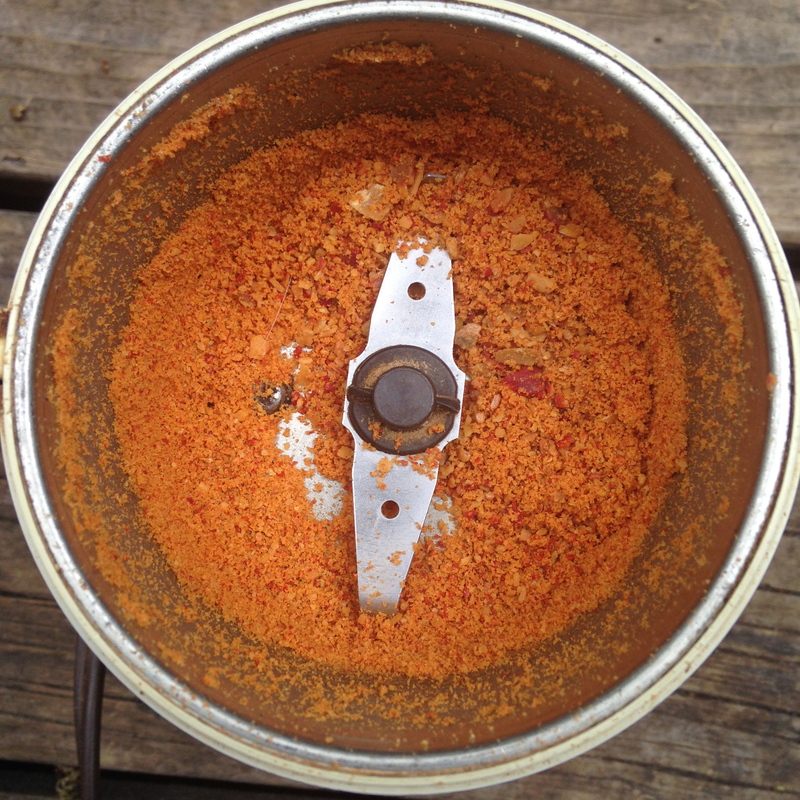 (Dry-frying spices is a risky venture as there’s a fine line between browning and burning. 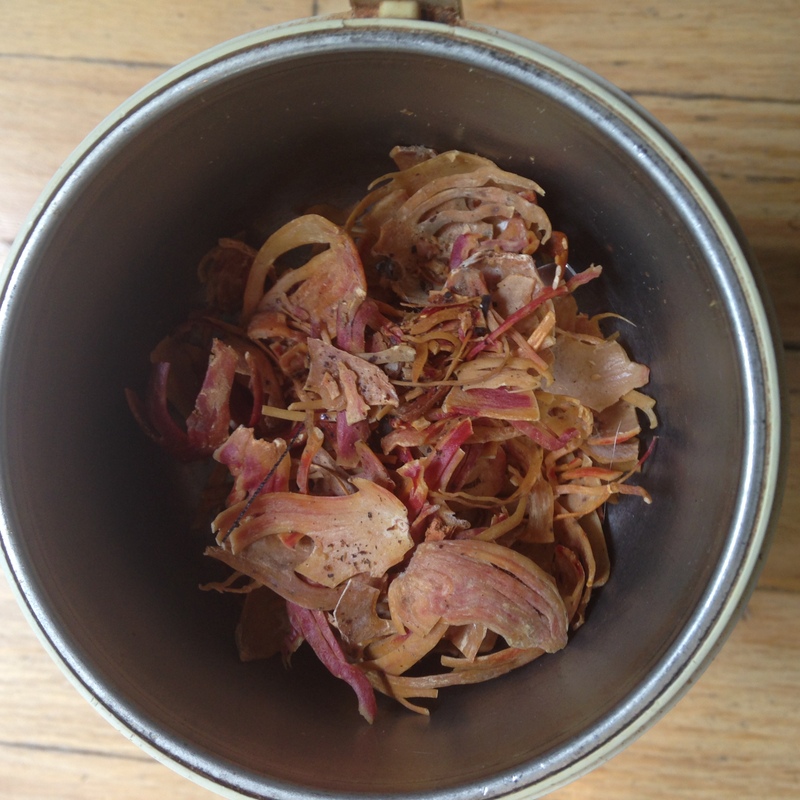 It helps to keep a sample of raw cumin seeds nearby as you dry-fry, to offer a visual comparison.) I like to grind the cumin seeds while they’re hot so as to savour the hot cloud of nutty cumin smoke released when the lid comes off. 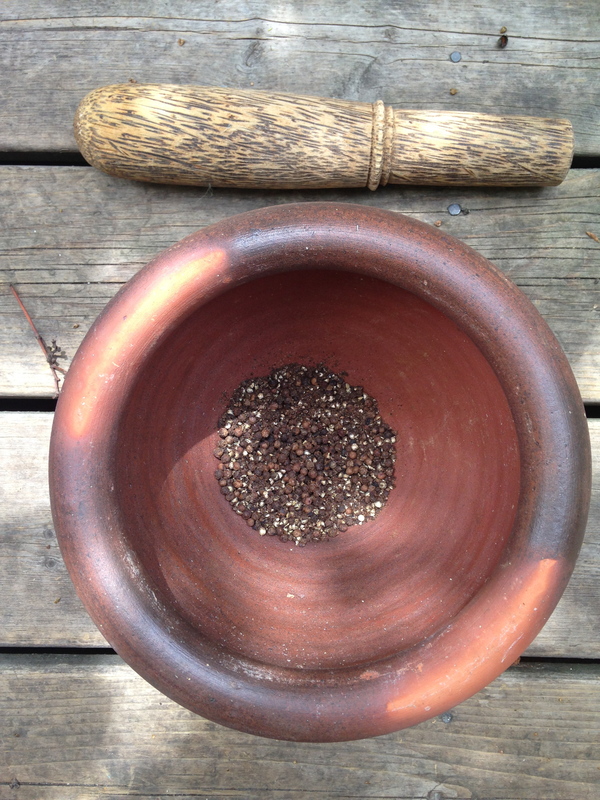 I used my Thai mortar and pestle to crack or coarsely grind the black peppercorns used in this rub. To add authenticity, I took my hulking mortar outside, placed it on my back deck and visualized the northern Thai town of Fang where I saw countless fine cooks squat and pound – a satisfying way to approach this kitchen tool and more effective than placing it on a kitchen counter. Last but not least, salt. 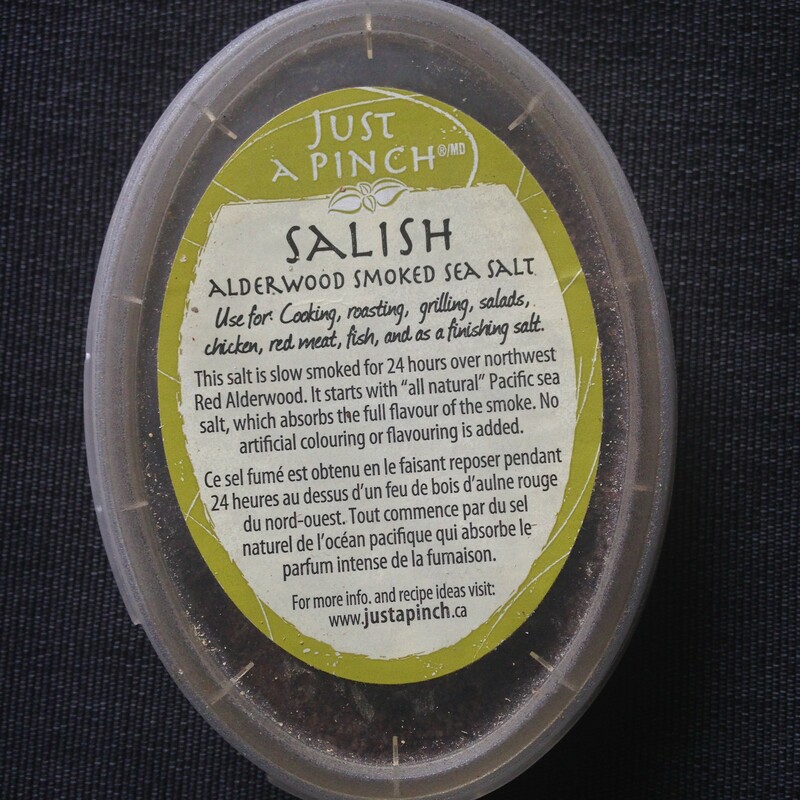 If you like smoky flavours, check out Salish, an Alderwood smoked sea salt. Get out your spice grinder and have some fun concocting this gorgeous mixture. 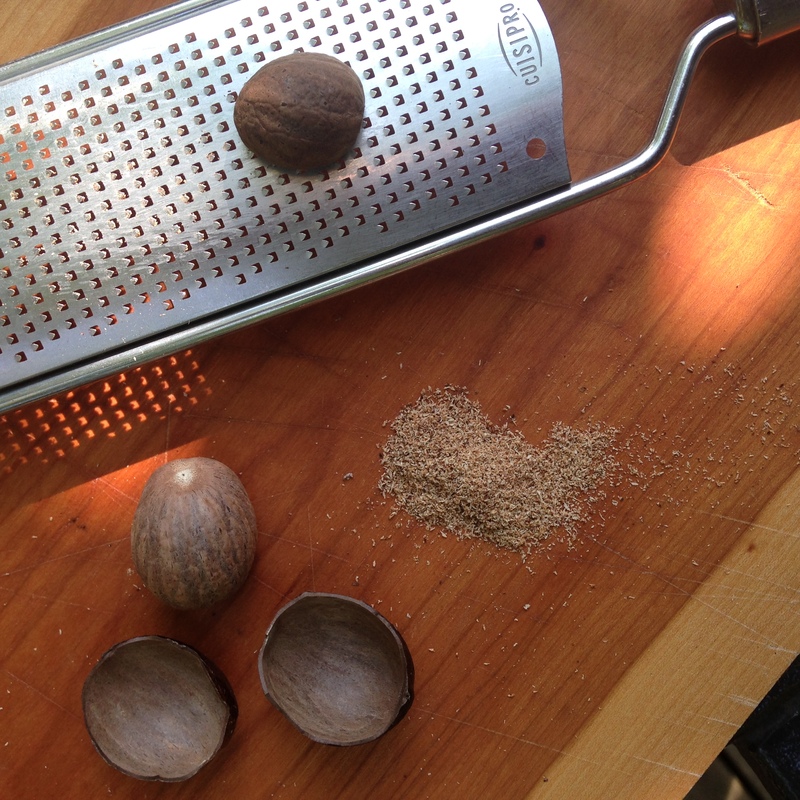 Whole nutmeg nuts can be found in Kensington or St Lawrence Market or Little India. Try this on grilled pork chops, baby back ribs or slow-cooked pork shoulder. Rub one tablespoon per pound just prior to cooking or better still, rub and refrigerate overnight.